The Southern African Development Community (SADC) inherited a world of trouble when it accepted the Democratic Republic of the Congo (DRC) as a member in 1997. Now it seems to have taken on another problematic 'existing condition' by welcoming the Indian Ocean archipelago state of Comoros into its bosom as a full member - its 16th - in August this year. Comoros should really go straight from new boy to SADC's naughty corner, a space normally reserved for the likes of DRC, Lesotho, Madagascar and Zimbabwe. But it's not clear that it will. President Azali Assoumani, who originally seized power in a coup, is again showing increasingly dictatorial tendencies after a period of relatively democratic behaviour. He plunged Comoros into crisis in April when he suspended the Constitutional Court, the highest court in the country, sparking opposition protests. On 30 July, Comoros passed a referendum to amend the nation's constitution. Among other changes, the referendum endorsed extending presidential term limits. It also abolished a power-sharing system that had rotated the presidency every five years among the main islands of Grande Comore, Anjouan and Mohéli. The changes effectively allow Assoumani to stay in office for eight years beyond his proper term which would have ended in 2021. Since the referendum, which was boycotted by the opposition, Assoumani has moved to consolidate power by arresting and issuing warrants for prominent opponents, including former vice president Jaffar Ahmed Said Hassani. Recently state prosecutor Mohamed Abdoua announced the arrest of five people, including Hassani's brother and the writer Said Ahmed Said Tourqui. The other significant baggage Comoros brings with it into SADC is its claim to the island of Mayotte, which is part of the Comoros archipelago but is not part of the Union of Comoros. Somewhat anomalously, it's part of France. South African officials said that at the recent SADC summit in Windhoek, where Comoros was formally incorporated into the regional body, some member countries questioned the wisdom of admitting the state. This was because it was evidently not complying with SADC's Treaty, which requires member states to respect democracy and rule of law. South Africa defended the decision to admit Comoros, saying it should be 'embraced' precisely so that SADC could help it solve its problems. Or was it more about boosting SADC's membership and therefore its prestige relative to Africa's other regional economic communities? In any case, SADC doesn't seem to have given much thought as to exactly how it's going to help Comoros. South African officials say the task falls to Zambia, which has just taken over from Angola as chair of SADC's Organ on Politics, Defence and Security Cooperation, which has the responsibility to tackle political and security crises in member states. But SADC has a poor record of trying to instil democracy in member states, generally tending to wait until discontent over democratic practices explodes into violence before taking action. In any case, an official in SADC's security department told ISS Today that the organisation was not planning to send anyone to Mayotte at this time. Perhaps SADC is leaving the problem to the African Union (AU). In July, Ramtane Lamamra, AU special envoy for silencing the guns by 2020, visited Comoros and urged the rival parties to resolve their dispute amicably. It also isn't clear how seriously SADC will take Comoros's claim to Mayotte. The Namibian Broadcasting Corporation (NBC) reported that Assoumani met Namibian President Hage Geingob - SADC chairperson - in New York last month on the margins of the UN General Assembly. 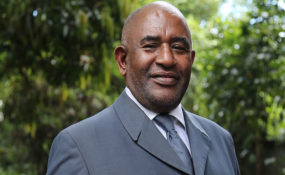 The NBC quoted Comoran foreign minister Mohamed El-Amine Souef as saying that Assoumani was seeking guidance from Geingob - and other SADC members - about how to start the process of reclaiming Mayotte. SADC no doubt shares the official positions of the AU and Comoros itself that Mayotte is a victim of lingering colonialism and should be returned to Comoros. However it is clear that the people of Mayotte don't want to be liberated from French colonial 'occupation'. In 1974, just before the rest of Comoros was to become independent of France, those in Mayotte voted to remain. In 2009 they voted again, by an overwhelming margin of over 95%, in a referendum to become even more integrated into France as that country's 101st Department. The depth of their commitment to remaining French is underscored by the fact that although the people of Mayotte are almost entirely Muslim, local judicial, economic and social laws and customs all had to be changed to conform with French law when Mayotte became a Department. The economics make it clear, though, why the people of Mayotte want to remain French rather than becoming Comoran. In 2016 Mayotte's GDP per capita was €10 608, admittedly only 31% of that of Metropolitan France. Yet it was 15 times that of the rest of Comoros. Mayotte as a result has a constant problem to keep illegal immigrants from Comoros at bay. Comoros doesn't accept them back when they are turned back from Mayotte and as a result, France doesn't accept Comoran visas. The situation has caused a standoff between Paris and Moroni. The Comoros government appears to realise that trying to liberate Mayotte from its colonial power would be difficult in these circumstances. So one sensed a rather pro-forma tone to Souef's remarks to the NBC in New York about how his government was seeking SADC's guidance about reclaiming Mayotte. He told NBC that Mayotte would return to Comoros once Comoros got the necessary political and economic support from SADC members. 'So then we will improve the economic situation in our island and so then that island itself will come back,' he said, likening the situation to that of Macau and Hong Kong which eventually returned to China after many years as colonial anachronisms. Souef seemed to be saying that SADC should provide Comoros with enough support that the country becomes attractive enough for Mayotte to 'return' voluntarily. That seems a long shot, since it will probably require Comoros to close that 15-to-one GDP-per-capita income gap. Perhaps SADC should nonetheless take Comoros at face value by giving it some stern advice that if the route to liberating Mayotte is indeed via boosting its own economy, step one should be to restore political liberty and therefore stability at home.